Extra Battery, How to Integrate with 24kWh Traction Battery? Re: Extra Battery, How to Integrate with 24kWh Traction Battery? mux wrote: That is not a normal mismatch, that sounds like heavily used modules. Typically, at beginning of life cell mismatch in a pack is at most a couple tenths of a percent. 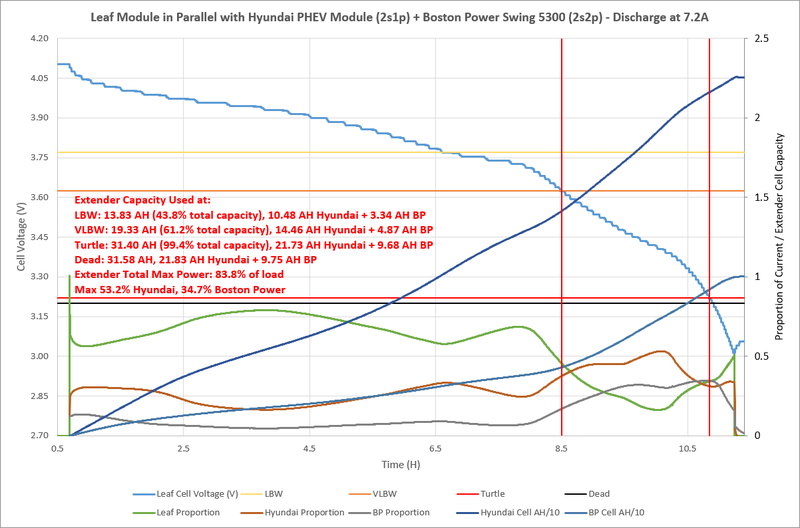 If cells were 3% apart like yours, you'd need balancing current in the order of ~0.3% of the charge current in normal use (that seems to be the rule of thumb BMS engineers have decided on, it seems to work for car and bike batteries). 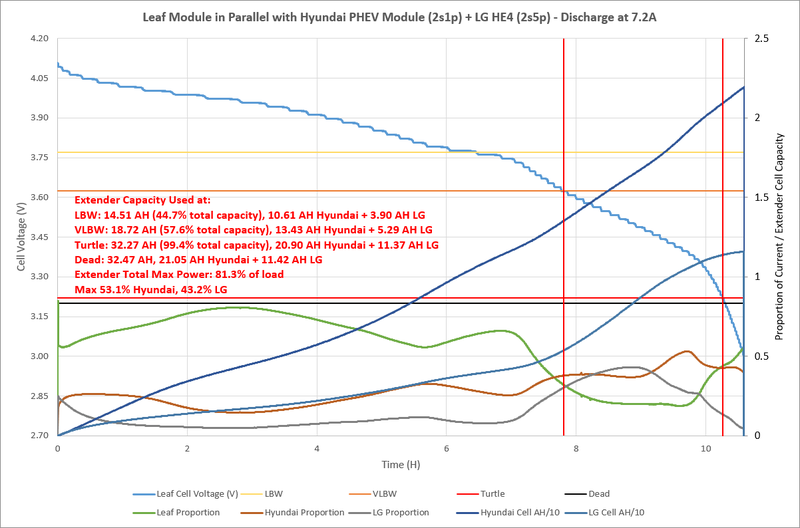 The Leaf has a BMS that can only do something like 15mA per cell, i.e. on the old 58Ah cells that's just 0.025% of nominal capacity. I take it your modules (VW ones I think you mentioned?) are all from a single vehicle then, and thus well matched to each other? The individual cells within each 8s module are well matched to each other, but my concern is the total 12s(8s) pack, where each group of 8 cells might be a different capacity than another. Nope, I have modules from 5 different cars. They're all well within a percent of each other. Finally got around to processing the data from the 3 cell type parallel test; the conclusions are a bit more complicated than I was expecting. 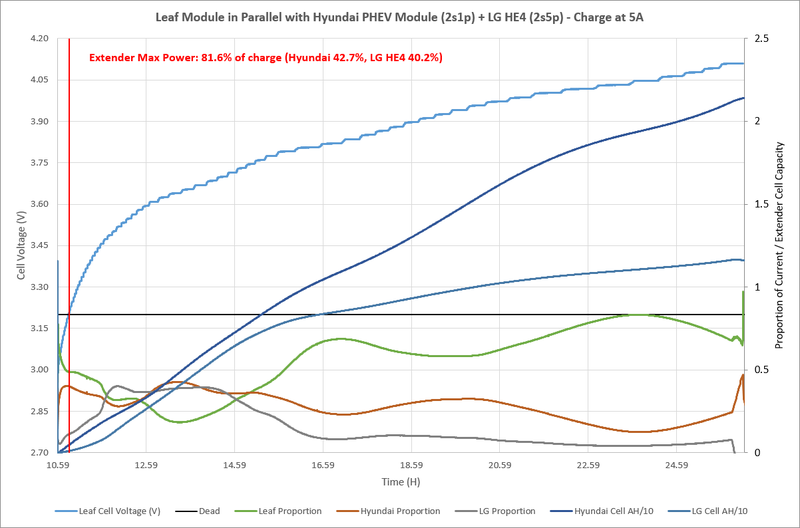 On the discharge side, even though the PHEV pack made up 69.1% of the extender capacity, it only provided up to 53.2% of the current, with the much smaller Boston Power pack providing up to 34.7% of the load. This means you would still need a very large Boston Power based pack (more than 8p or about 13.8kWH) worth, likely more, since it would also increase its current proportion as the capacity increased. On the charge side, there are no concerns, both of the extender battery types can handle at least 2C. 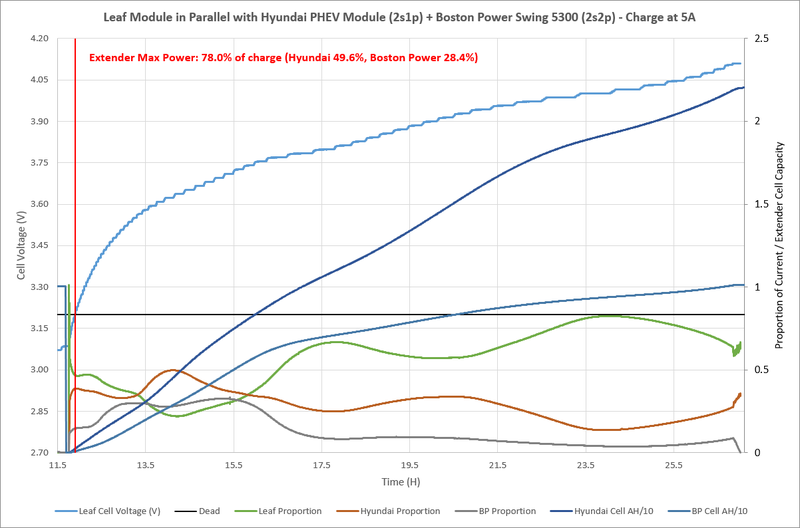 The Boston Power pack would get a max of 1.67C and the Hyundai pack a max of 2.28C. Next step is to try 2s5p of the LG HE4 cells since those can handle significantly more discharge, at the tradeoff of lower charge rate. I should probably just mention here that I did try on my last big trip to do a full Leafspy log, but for some reason the logs came out really bad. Lots of large gaps and mangled data. Basically unusable. I was hoping to get a nice current/voltage graph out of it, but alas. I'm now programming my own logging tools that are directly on the CAN bus so I have basically continuous logging of arbitrary EV-CAN values. I'm not sure why my leafspy is so unreliable, might have to do with the BT ELM327. I have noticed that Leaf Spy drops connection to the BT dongle and/or vehicle occasionally, likely the cause of the problem. Note the second graph is just an extrapolation of the 2s discharge behavior, I don't have the means to test this in a real scenario. 92S would be very dangerous; you're either severely overcharging cells or you have to include special circuitry to actively limit charging to a lower top voltage and monitor top-unbalanced cells so none of them go over their nominal voltage. I bet that if you'd remove the extra charge above 4.1V, the additional capacity would be minimal. Edit: just to be clear, there's basically no difference in the cell degradation different chemistries see above 4.1V. All lithium ion chemistries get Li+/Li2+ instability/passivation at high voltage and have drastically lower cycle life at their maximum rated voltage compared to 4.0-4.1V, even though the actual capacity in the top stretch is pretty limited. For a vehicle, where you really don't want to be changing out batteries every 100 cycles, I'd keep to 4.05-4.10V per cell at most for any chemistry, unless you know damn sure what you're doing. Do you have some QC LeafSpy graph like this one? Nope, my Leafspy fucked the logging up. Working on better logging solutions right now. 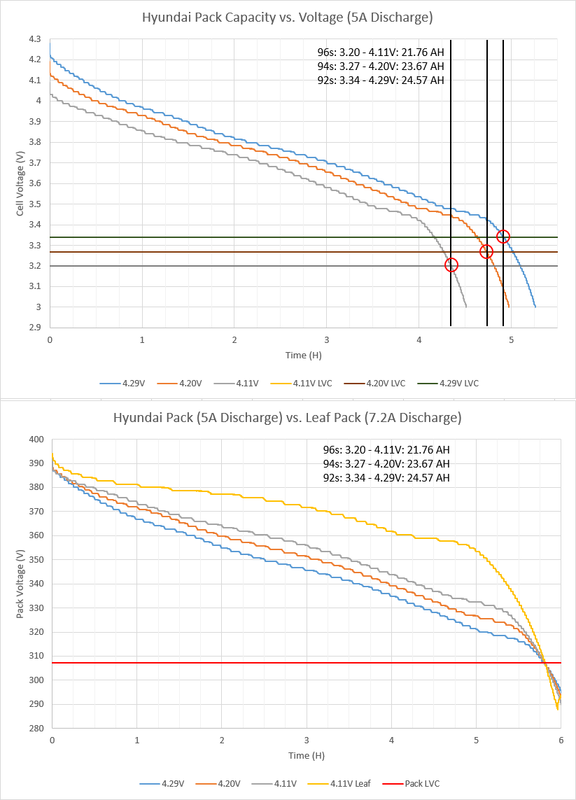 Charging is a bigger problem, the LG pack took up to 40.2% of the charge current, which would give a worst case of 50.25A for the pack, or 10.05A/cell, more than twice the rated max charging current of 4A. To get that down to 4A the pack size would have to be increased to at least 13p, or 11.5kWH nominal. Or you can just wing it with smaller packs and hope they don't catch fire (I do not condone this). Yep, this goes back to the discussion before all this testing: you HAVE to make an 18650 pack pretty darn big to have it make sense. 15kWh+ before you can use... any available cell, 20kWh+ before you can use relatively affordable commodity cells and much larger still to use the cheapest ones. Fortunately the cost of these cells is pretty low, so it's still much cheaper than buying anything new on the market as far as large-battery BEVs go. But it's not something you can bootstrap from a small pack.